LTHForum.com - Elderflowers are blooming can Elderberrie's be far away? 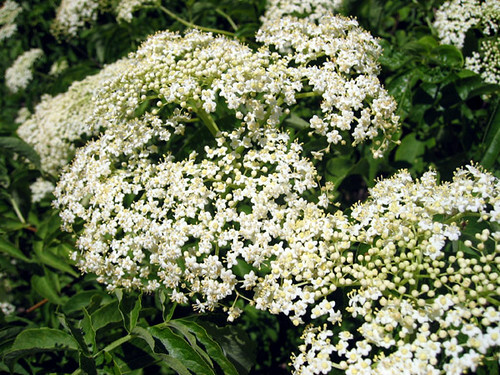 LTH Home > Chat > Gardening, Farming and Foraging > Elderflowers are blooming can Elderberrie's be far away? A recommended method for plucking these berries is using an Angel Food Cake slicer to comb them off. Once you know what you are looking for, then they seem to be everywhere from late June through early July. Elderberries are at their peak bloom presently. If you hope to get their berries, they are easy to source locations now. I don't recall if I said this before....when I was a child, elderberries grew close to my shabby horse barn on my grandparent's property. My grandfather would pick the flowering stems and give them to my grandmother, who in turn dipped them in a flour-based batter and pan fried them. I can still remember the distinctive taste. Of course, this was the man who was loved to tell visitors that there were 24 kinds* of greens to eat in your front yard and you never had to worry about starving. From lamb's quarter to curly dock, an edible meal was always at the tip of your toe. * I may be misremembering....I was a young child, it was a lot of weird stuff! On Friday, I received an e-mail inquiring if I knew where to find dried elderflowers. I had no idea, though I advised they just missed their bloom period. I did suggest they may be interested in some elderflower nectar-concentrate I had made. On Saturday, I was a passenger in a car. We passed what seemed to be a stand of blooming elderflowers along IL-22. I wasn't 100% certain, because the bloom period was over. At the speed we were going, it could have just as well been a stand Queen's Anne Lace or hydrangeas. Sunday I drove around visiting the farms. As I drove about, I kept a keen eye for elderflowers and saw nothing. I steered the car home past the area where I thought I might have seen those elderflowers. I was right, though this bush had several stages of development: several masses of flowers, at least one flower head filled with buds and many more masses of ripening berries. For the 100 miles I covered on Sunday, this was the only stand of flowers. I went home to contact the person who e-mailed me. They were thrilled because they needed those flowers to replicate an ancient cheesecake recipe called: Sambocade. It was a pleasure to meet them and learn their project. The husband remarked, he is a poster on LTHforum, too. He joked, "I have as many posts as you." I am wondering where this may be going. "I have may four and you have 13,000!" It's always fun to meet another LTH'r, whenever they pop up. I have to tell you, they were very, very lucky to get those flowers. C2, I have a horror story for you. I grew tired of sourcing wild elderberries for wine-making, and decided that I should grow them in my backyard, alongside my three dozen grapevines. There are new cultivars available, the result of selection and crossbreeding at a number of ag station in N. America and Europe. These new varieties produce much larger berries, larger clusters, and larger crops. Unfortunately, they are larger invasive, too. I decided they were taking up too much room and tried to get rid of them. I've been trying for 7 years. They're winning. Sooooo, while cultivated elderberries are far superior to wild ones, think twicet or thricet about planting some in your backyard. I saw Elderflowers today. This is a great time to locate them while they are easy to see, then come back later for the berries. Elderberrys equal elderberry (purple) bird poop. razbry wrote: Elderberrys equal elderberry (purple) bird poop. Allow elderberries to macerate 21 days in the spirits, shaking the jar once a day. Filter the solids out using a large paper coffee filter. At the first sign of respiratory flu symptoms take one tablespoon morning and night. t will lessen the influenza to about 3 days and lessen the severity considerably, (it will NOT work as a prophylactic). Or, you could spend about $21 for 4 oz. of Sambuchol at Walgreens. You can't prepare for a disaster when you are in the midst of it. Thanks Cathy, I just saw this post. I'll have to keep an eye out for them while I'm out foraging. I love that photo of the elderberries with the glistening dewdrops. The blooms are just about spent now. Hi, I'm working from home today and saw a repeat of Ruth Reichl's visit to Blackberry Farm. This recipe looked lovely! 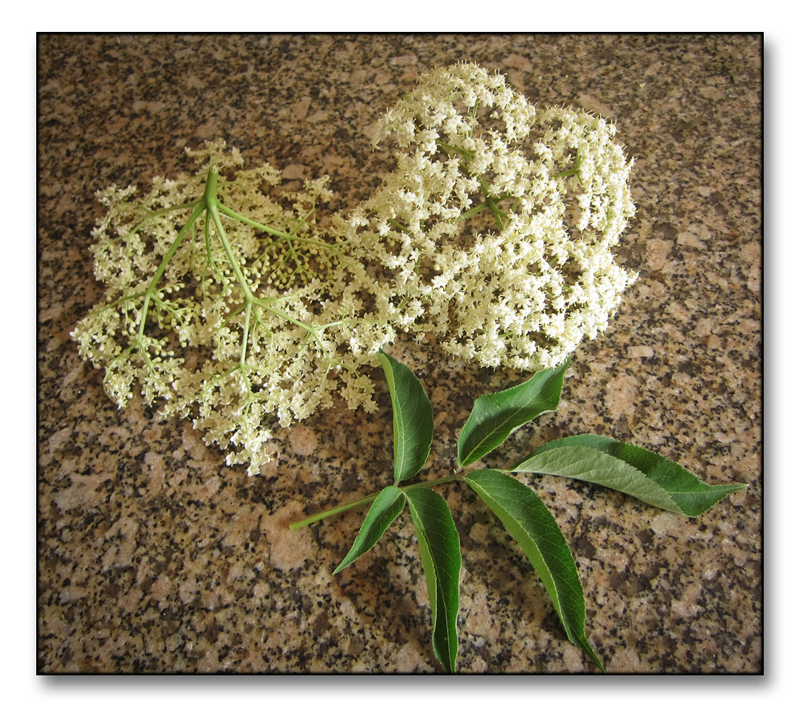 The difference is that on the show, they stirred the elderberry blooms directly into the preserve. Can you tell, I'm ready for summer? I am seeing Elderflowers everywhere presently. Two years ago, just after the flowers had faded, I was contacted for elderflowers for a recipe. If you think you may need some, now is the time to seek and dry them. I'm seeing them all over as well...in ditches, fence lines, railroad tracks. razbry wrote: I'm seeing them all over as well...in ditches, fence lines, railroad tracks. 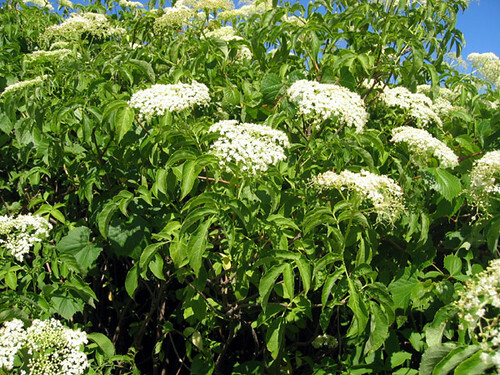 While they are in full flower, it is best to note the locations to try to harvest elderberries later. If you can get to them before the birds. If you are so lucky, I have read of people using angel food cake servers (looks like an afro comb) to comb out the berries. You almost never find elderberry bushes in domestic landscapes because they are hard to keep reigned in. I happen to have two ornamental elderberry bushes in my landscape. In five years, they have yet to flower. I've made a *lot* of elderberry wine, so I had to develop a quick and efficient means to separate the berries from the flowerheads. Turns out to be simplicity itself. Get yourself a 5-gallon white paint bucket [white is better from a plastics point of view, IMHO]. Cut the flowerheads with about a foot of stem left on them. Then, in an overhead motion, swing the flowerhead such that the stem hits the rim of the bucket, and the berry mass crashes against the side of the bucket. With a bit of practice, you'll be able to get 90% of the berries in just a couple of smashes. Riper the berries, more successful the method. AWESOME advice on separating out the berries....thanks! Hi - can anyone recommend a good place to find elderflowers, that is also easy to get to from downtown Chicago? I'm originally from England (where elderflower cordial is found in every grocery store), and I've been extremely keen to make my own elderflower cordial ever since I moved to Chicago, but I never know where to look/never see them anywhere. I know their blooming period is probably coming to an end already, but I would really appreciate your suggestions so I'm ready for next year. I don't live in the city. In unkept areas along railroads, country roads, along highways, they are there. In the city, most of the land is managed and very likely harder to find. - Along route 41 in the Lake Bluff, North Chicago areas. Especially at the railroad crossings at Martin Luther King and at Buckley Road/137. - On Sheridan Road, across from Fort Sheridan, closer to Lake Forest than Highland Park or Highwood. - Half Day Road (Route 22) between 41 and Waukegan Roads. There are some intentionally planted on the median strip closer to Waukegan Road. Today I saw stands of elderflowers with some flowers fading to berries and others still quite fresh. The flowers are everywhere here in WI. We are fishing on streams in and around Viroqua. So how do I harvest and bring them back? What do I do with them? but not a lot of berries in this location. I found another group of plants that look better but won't be up that way till Tuesday. Must be a truly wild bush-- the domesticated selections have much denser flower clusters. But the berry size is good. The birds haven't found it yet, eh? Good luck on that! The other plot (also wild) should have a much denser berry load as when I drove by on Wed. the berry branches were bent over due to the weight! Nice pic, mhill91549. This thread is reminding me that I had spotted some elderberry locally using C2's strategy of making a note when the flowers are blooming. But I missed the berries after all. Luckily, I have found a stop-gap. Wyldewood Cellars Elderberrry Juice Concentrate. The bottle specifies that the product is "not an extract" and that it contains "no added sugar." Wyldewood Cellars is an elderberry (and other fruit) winery in Kansas. They also sell plants. Here is a link to their website for mail order and the locations of their other outlets in Kansas and Illinois. I bought the extract at Local Harvest Grocery in the Oak Hill section of Tower Grove South in St. Louis. OK, confession here, while I had customers running around picking raspberries here at my farm, I snuck off and gathered elderberries! It wasn't far, and I wasn't gone long. I finally found a sweet spot where I didn't have to climb down ditches to get to the plant. I took my time and cleaned out about 8 lbs of berries. They make an amazing jelly...very "grownup" as the berries are not all that sweet. It was a fun job on Labor Day. 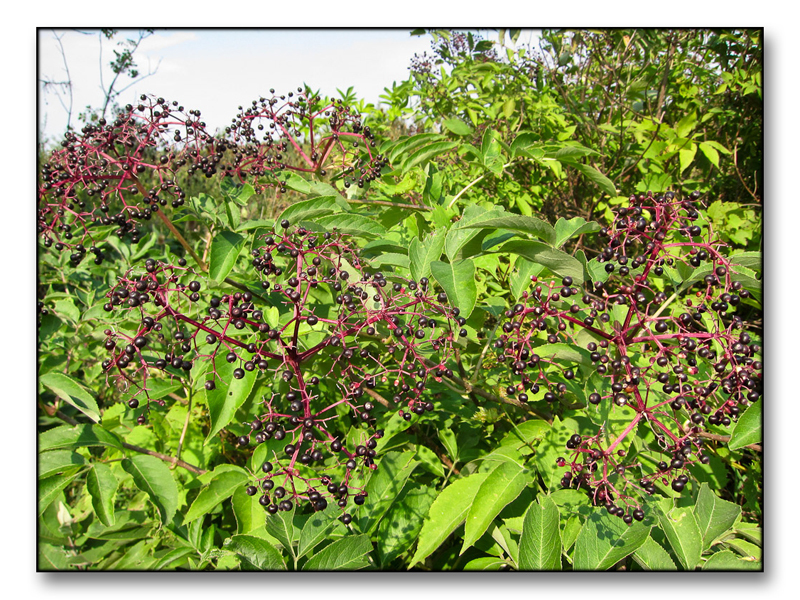 According to Smithsonian Magazine, Elderberries are the source for the food dye used in the USDA stamp on meat. 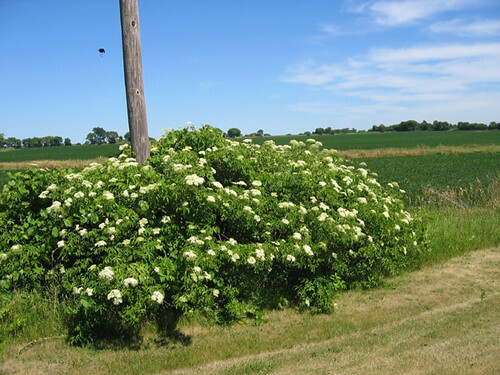 Last week when I was in Minnesota for their State Fair, I saw a clump of elderflowers. It was a bit startling since our season for these was in late June early July. Seedlings had elderberries at the Lincoln Square farmers' market today.